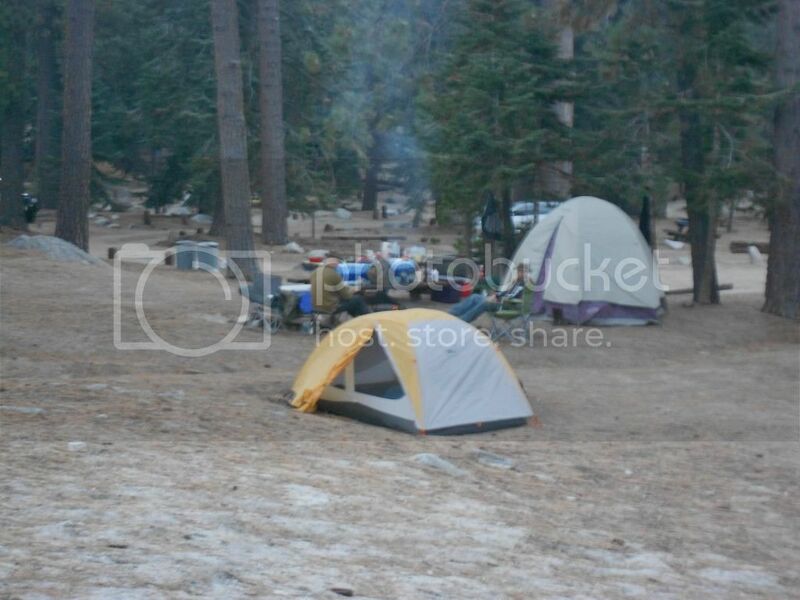 Backpacking tents, lets see 'em! 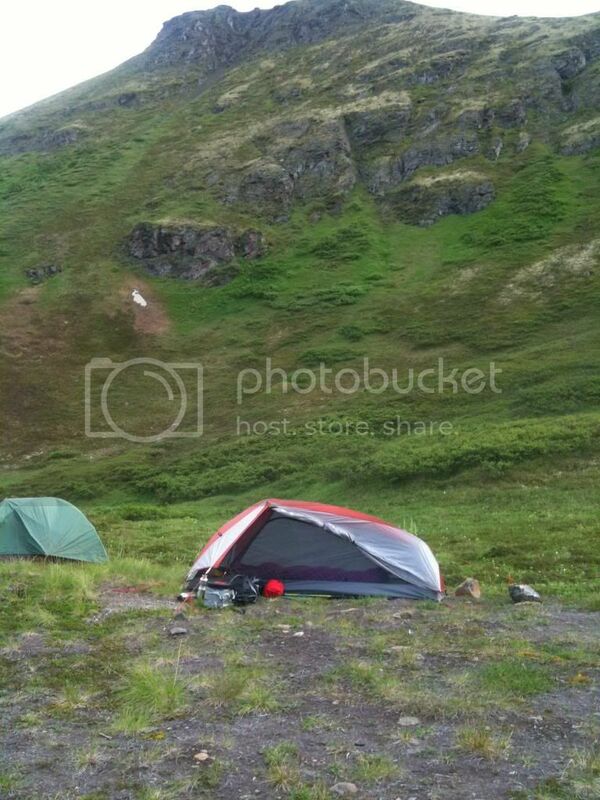 Discussion in 'Backpacking' started by joshkelekovich, Apr 16, 2013. 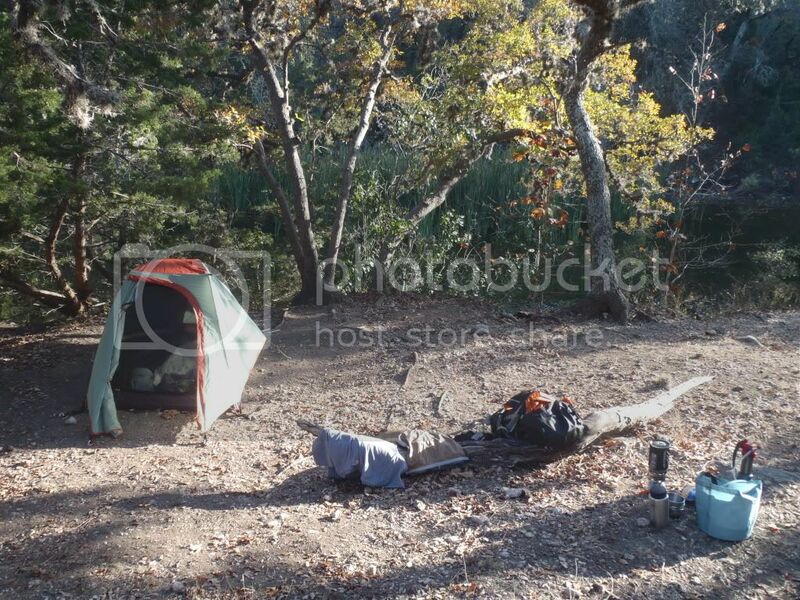 So I have been curious about backpacking tents for a few weeks now, and I was just thinking about seeing what others carry and what they think about them. Pics would be much appreciated. So, without further-or-due, let's see 'em! 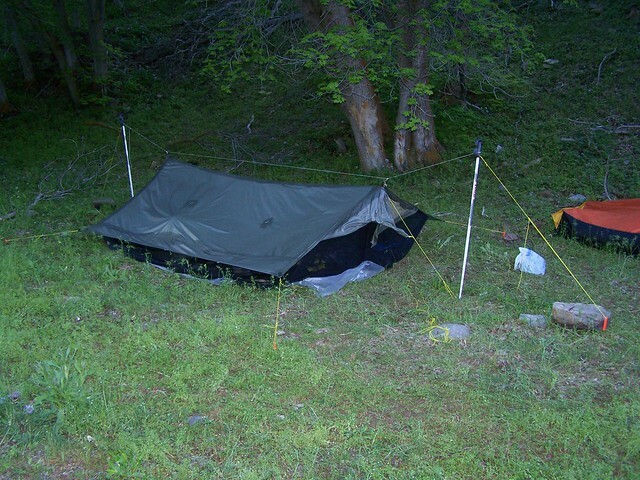 For me its hard to beat the Henry Shires Tarptent Rainbow, single wall and very lightweight. Around 28oz with stakes. Mines on the right (Eureka Solitaire). I got it on impulse on clearance then read the reviews. It got bad reviews for the poles snapping, but I used mine for 4 days and 3 nights in pretty high winds with no problems. Wesleypipesyo, Sosteve and bacpacjac like this. Sierra Designs purchased @ 1988. Still going strong! kronin323, Wesleypipesyo, Sosteve and 4 others like this. Six Moon Designs Lunar Solo. 23 oz. Sosteve, WILL, Timex and 3 others like this. Wesleypipesyo, Sosteve, Timex and 2 others like this. In summer, we use the Sierra Designs Orion AST3 (no longer made). We've made use of this tent for a decade and a half of canoe- tripping and it's never let in any water despite weathering some brutal storms. Sadly, it's on the heavy side for backpacking as it's a 3-person tent, but we use it mostly for canoe-tripping and we used to share it with our dog (pictured below). 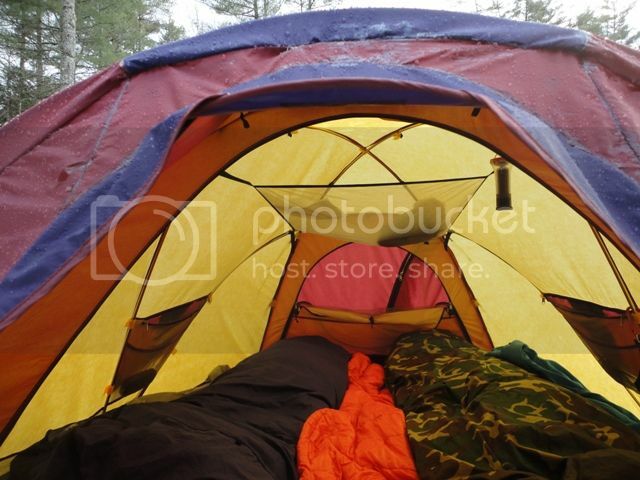 In the shoulder seasons we use the Marmot Thor 4-season tent. Again, it's not light because it's intended to be able to hold up to a blizzard and heavily snow load, but we've used it backpacking in late winter/early spring when there was still snow. 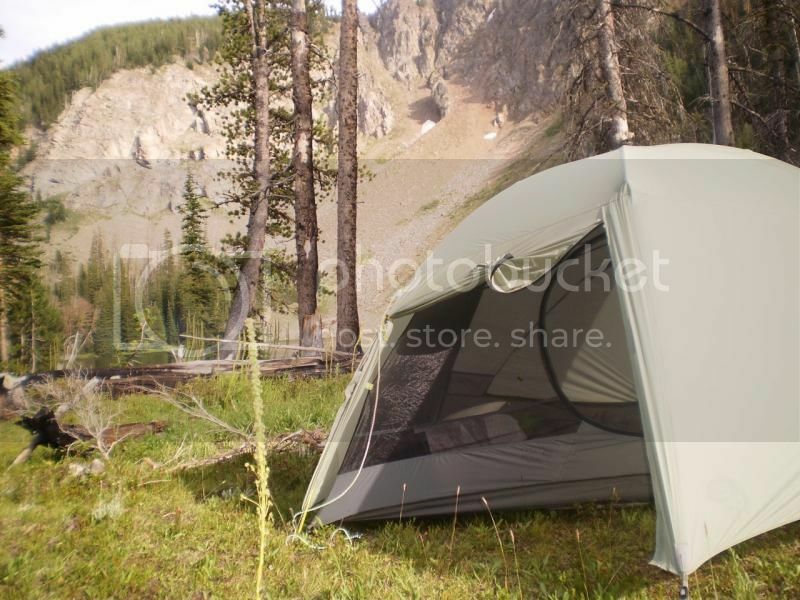 It's very solid and vents moisture quite well, which is what you want in a 4-season tent. In winter, my shelter of choice is an igloo, so instead of packing our 4-season tent, I carry the Icebox Igloo tool for building bright, warm, roomy igloos. The tool is a slip form that packs up flat. It's the black & yellow object next to me in the photo below. Boomstick, americanstrat98, Ragman and 9 others like this. There are already plenty of posts about the eureka solitaire. It's a little more difficult than some to setup. I really like it a lot though. 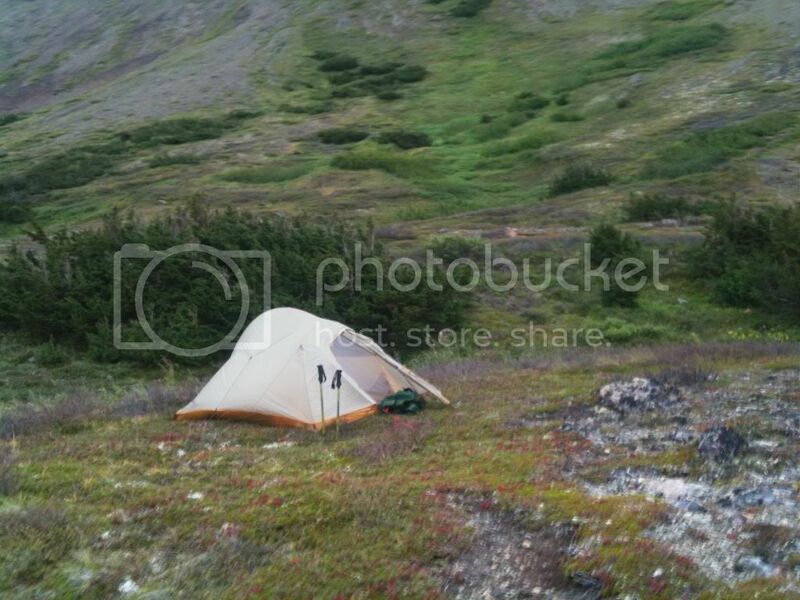 It's the only backpacking tent I have ever owned. 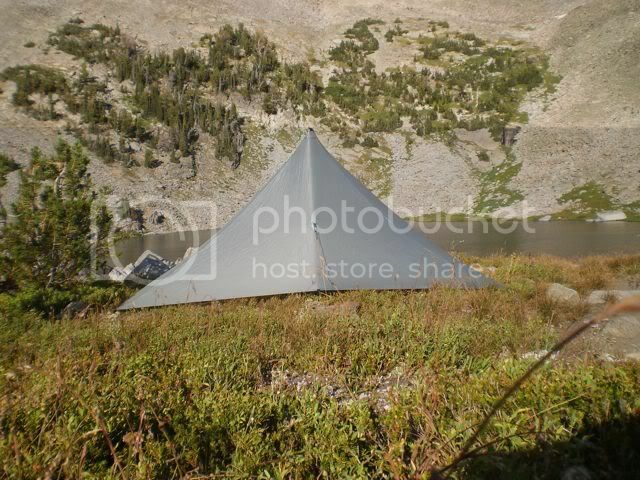 The last backpacking trip I took a bivy sack and a tarp. Much more interesting sharing your bed with crawling things. Awesome guys! Lets keep them coming! kronin323, Ragman, Wesleypipesyo and 3 others like this. +1 for the Rainbow. I have one, too. six moons designs skyscape scout. ~34 oz. packs to the size of a nalgene (including poles) keeps out the bugs, wind and rain. my high desert go to. Sosteve, WILL, Timex and 1 other person like this. This is the same one I've got. Had for maybe two or three years and haven't used it more than a handful of times. No complaints, just prefer my hammock most times. This is our North Face Rock 22. It only accompanies me when my wife comes along. 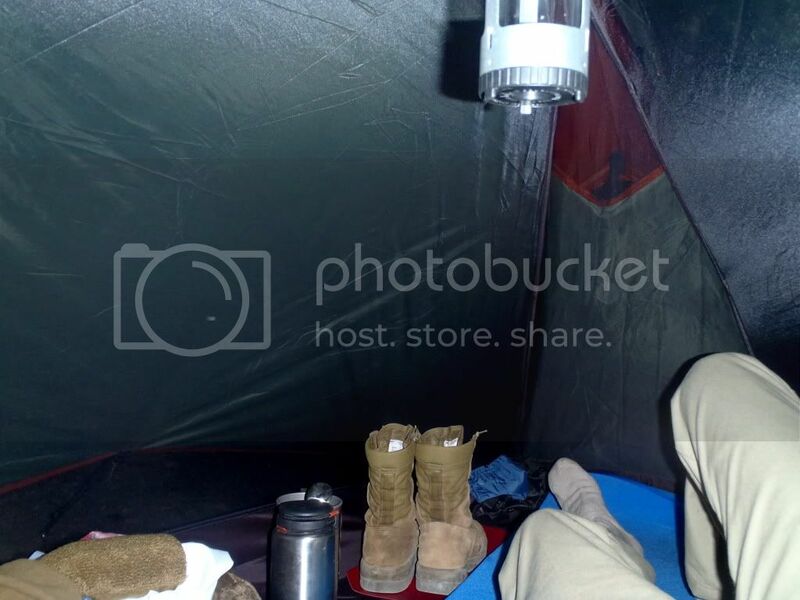 It's not an ultra-light tent, but it's fairly bombproof. Sosteve and bacpacjac like this. Sosteve and Timex like this. My Big Agness UL-2 is about 7 o'clock in the image. Really love my REI Passage 2 well designed simple tent. Two doors which is nice so you don't have to climb over the person beside you for the those natures call events. Not and ultraligth and i've used it more canoe camping. 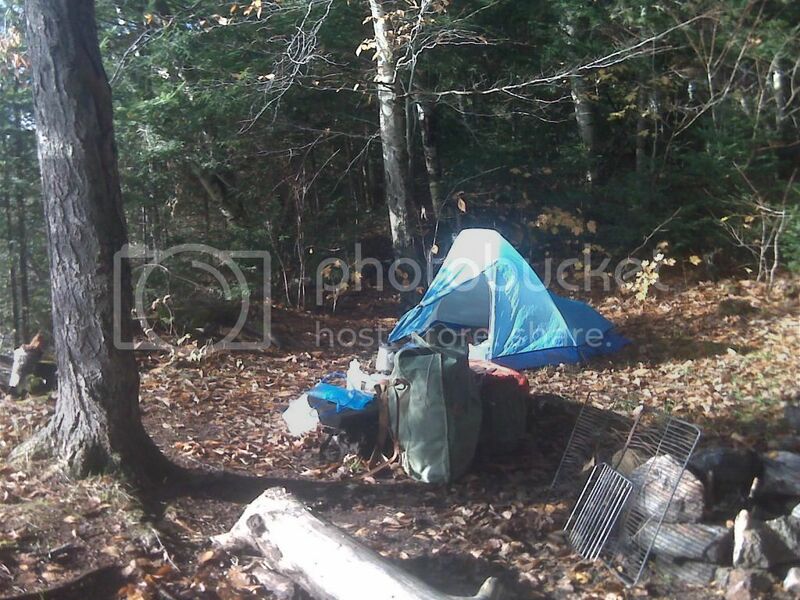 The picture included is a nice camping site on an island on the Youghiogheny River Pa. I think it is light enough and small enough that I could take it back packing. 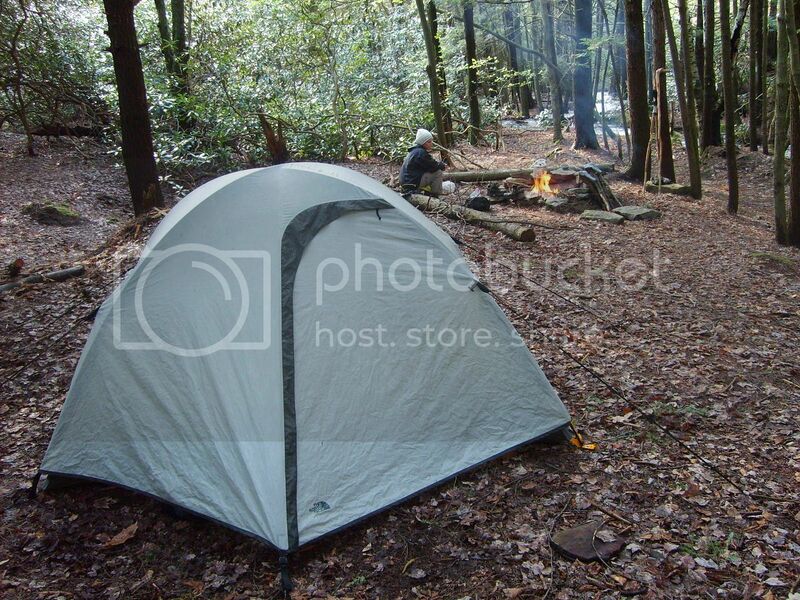 Here is the tent I use, it is a REI two man 3 pole. Kind of big but is nice in the rain and wind. I don't think they sell this one anymore. I have owned since the late 90s. 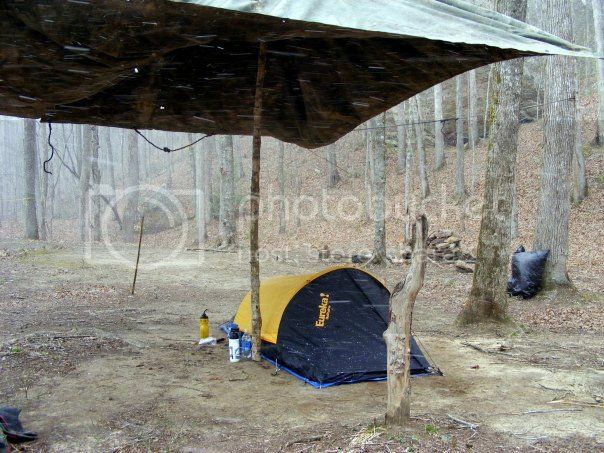 Mountainsmith Mountain LT http://mountainsmith.com/index.php/mountain-shelter-lt.html Love this Tarp. My go to Elk hunting Tent. 2.3 lbs. 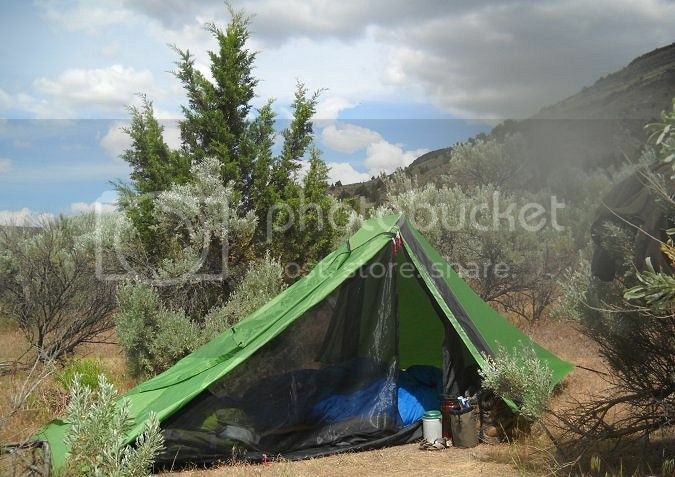 The Wing Tent can be used with the inner screened sleeping area or without as a stand alone tarp. I setup my Mountainsmith Mountain LT Tarp Tent. Below are the pictures. Stats are 2 people 53 square feet of room. Lots of room for 2 plus gear or a palace for 1 plus all your hunting gear. Retails for 130$ But Ive seen it some places for 107$ Cant say enough good things about this Tent. Weight is 2.3lbs. Uses Trekking poles to Pitch it or you can pitch it with the Guy lines on 2 trees that are within range. Or you can get sticks in the woods that are 40 inches for the back and 53 inches for the Front. Here are the Photos of mine with me in it. For reference Im 6' Tall 250 lbs. Super sturdy also You cannot blow this tent over I dont care what kind of wind you get. If I guy out the sides it gives you even more headspace and makes it bombproof. Some guys are putting stove Jacks in these and packing in the Kifaru Stoves that weight 2lbs to setup for late fall winter camping. 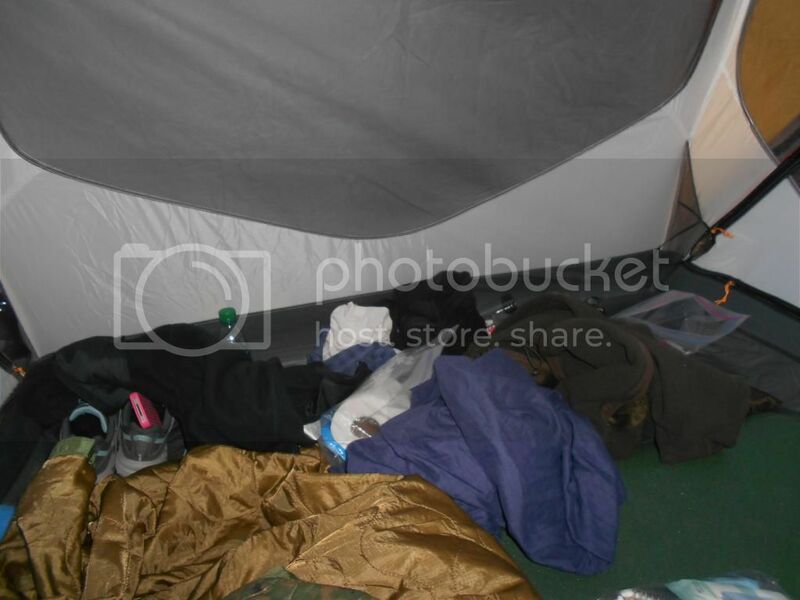 Its a palace of a tarp tent. 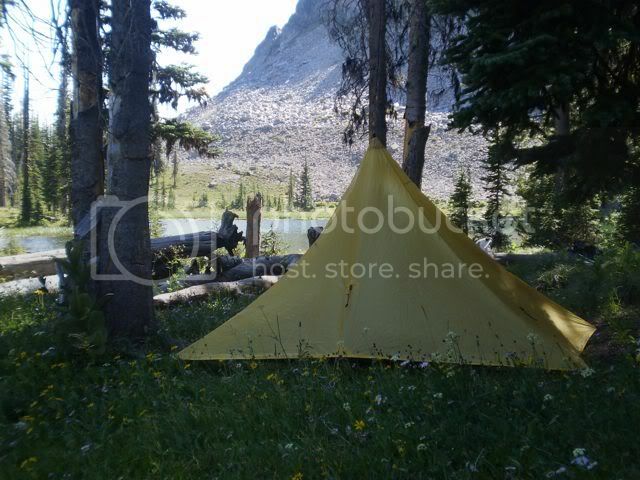 Just a bit smaller then the Kifaru Megatarp bigger then the super tarp. 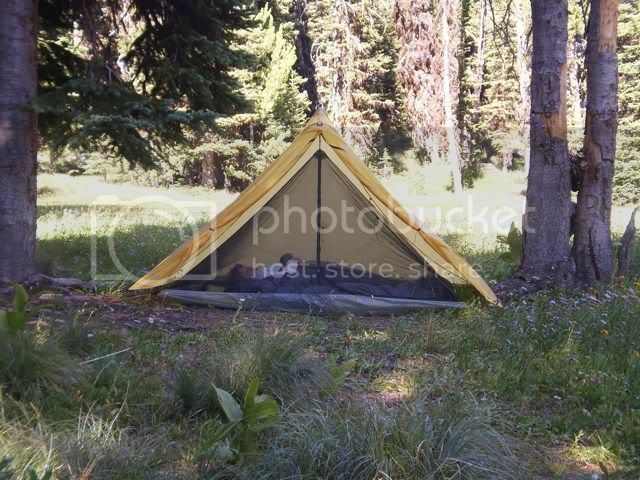 Actually I just set this Great Basin solo tent up for the first time yesterday. This was a surprise find for me as my brother gave me two tents and really didn't have much information on them. I've used the bigger one quite alot for our annual memorial day weekend camping trip, but think this smaller one will come in handy for solo adventures as it packs down very nicely. This is the big one...two rooms with a separating partition. It got a tear in the seam bottom front left corner....I need to see if wallyworld has a patch for me. 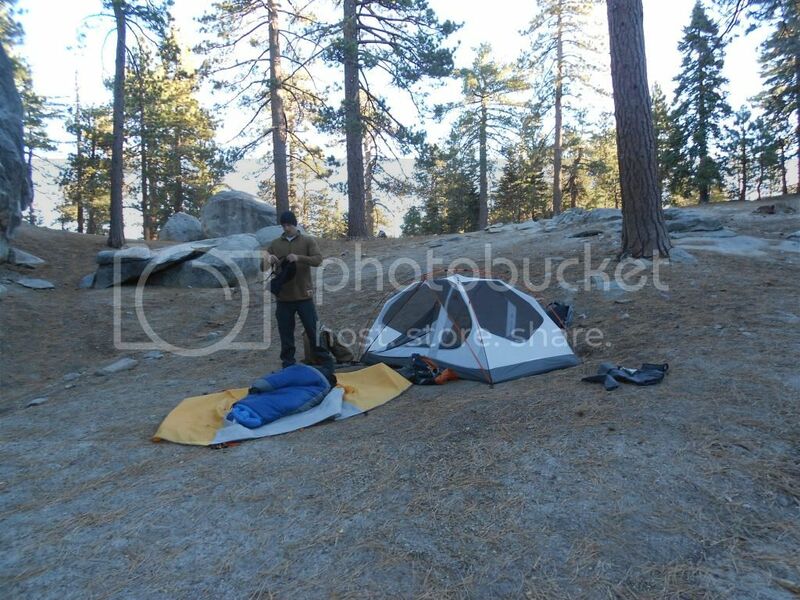 I've got a 1 man from Alps Mountaineering and a Halfdome 2 Plus from REI. Heres the 1 man from a trip in Texas. Sosteve, VISWartyPig and bacpacjac like this. kronin323, Sosteve, WILL and 1 other person like this. Love this tent. 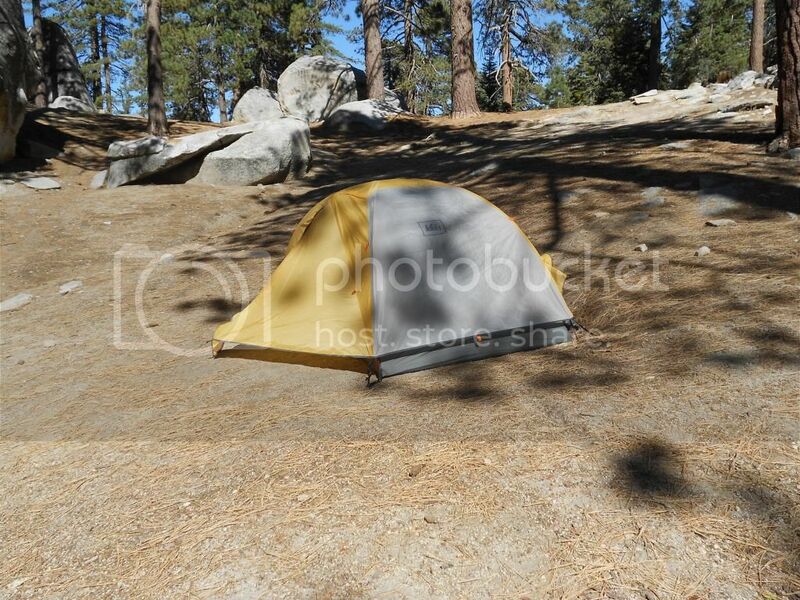 This is the tent I grab when there are two of us. 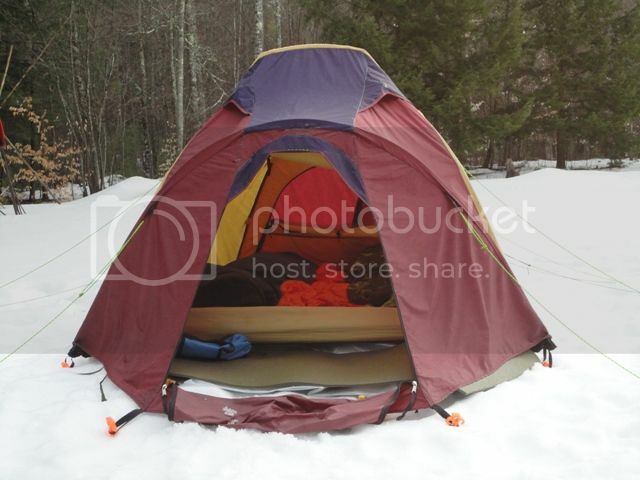 Two doors and two vestibules make this a roomy tent. Quick set up as well. slowtaknow and bacpacjac like this. Yea its great isn't it? Its a great combination of price/features/size and even weight when split between two people. I'm no ultralight type tho. I love the vertical walls on the sides, it makes it feel super roomy inside. I'll never get a tent that requires the poles to be shoved through tunnels of fabric again. Those clips on the Half Dome are the business. I setup my Mountainsmith Mountain LT Tarp Tent. Sierra Designs Clip Flashlight, bought in 2002 or so. It's worked out well, but is pretty small. If I were to get another one I would choose a freestanding model. Sosteve, beacon and The_Skill_Seeker like this. 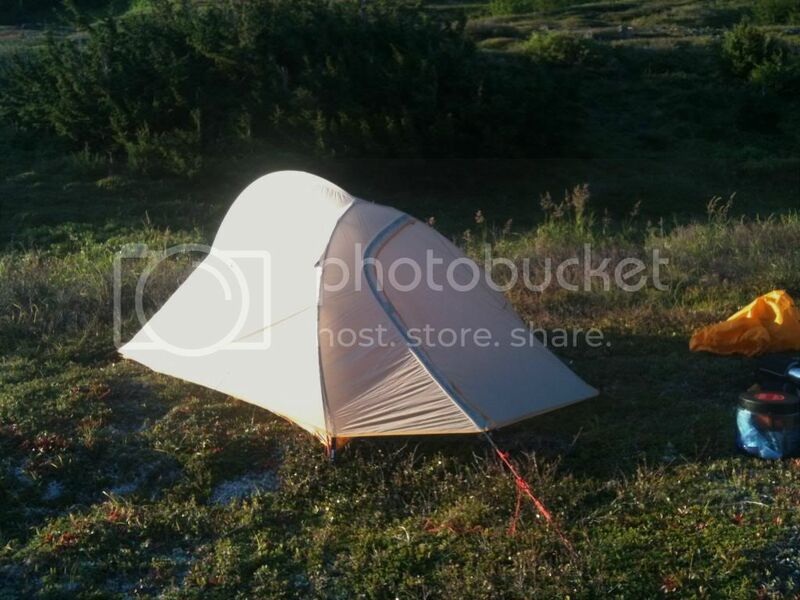 My LL Bean Microlight FS1 - a free-standing 1 person tent. Just big enough inside for sleeping. It's a side entry with a roomy vestibule that I really like. Holds up really well to wind, too. The vestibule is rolled up out of the way for this shot, but extends way out and has enough room for a pack and plenty of room left over. You can see my pack there in front of the vestibule, on the left side, for scale. 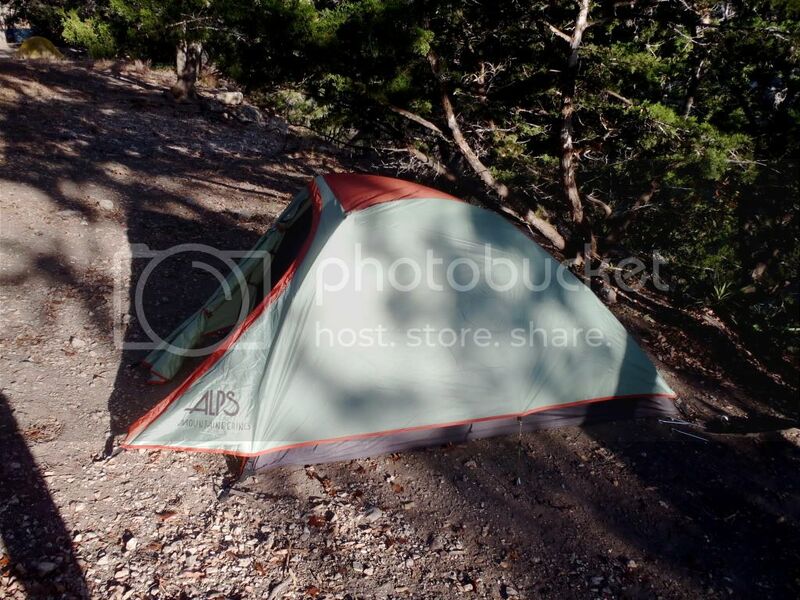 And my Big Agnes Fly Creek UL2 - front entry, room for 1 with gear inside, or 1 plus dog and gear (which is why I got it) or two people if you don't mind cuddling. 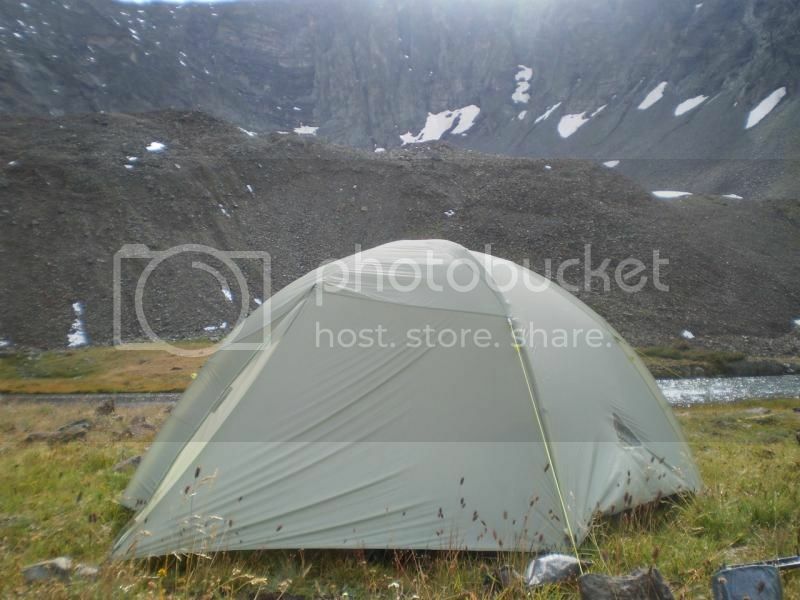 This is my current go-to backpacking tent. It has more room than the FS1 above, although I do prefer the side entry and vestibule set up of the FS1. But the UL2 is lighter in weight despite the larger size, and packs down smaller than the FS-1, so it's become my go-to tent. 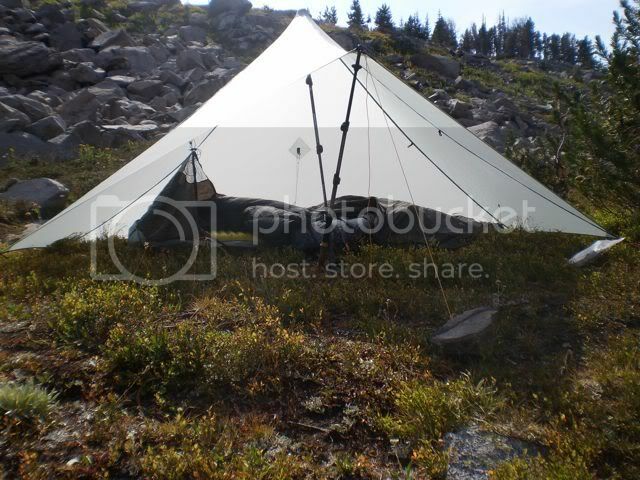 Nylon 7'x9' tarp and a ground tarp (4'x6' or something?) 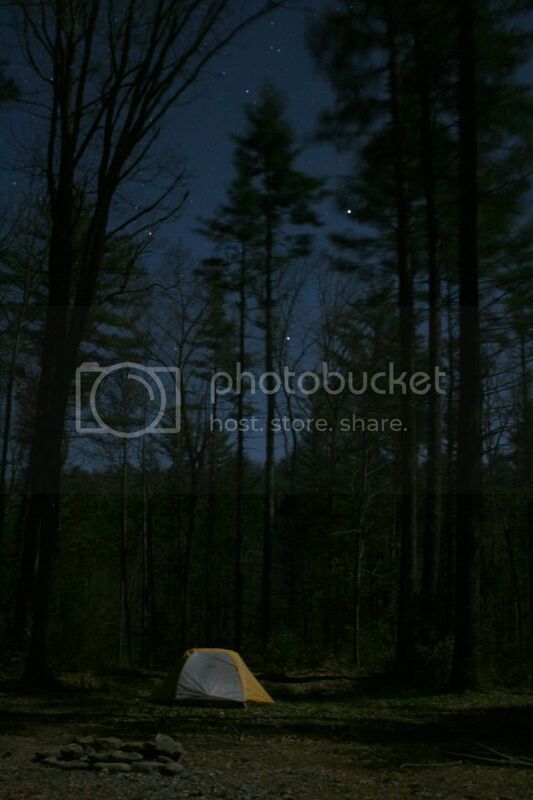 is what I like to take backpacking. Sosteve, Robert Highhawk and beacon like this. Sosteve, bacpacjac and velocitymj like this. kronin323, Sosteve, lodge camper and 1 other person like this. Timberline 2. At around 7lbs it's a bit heavy, but split up between a couple of people it's ideal. 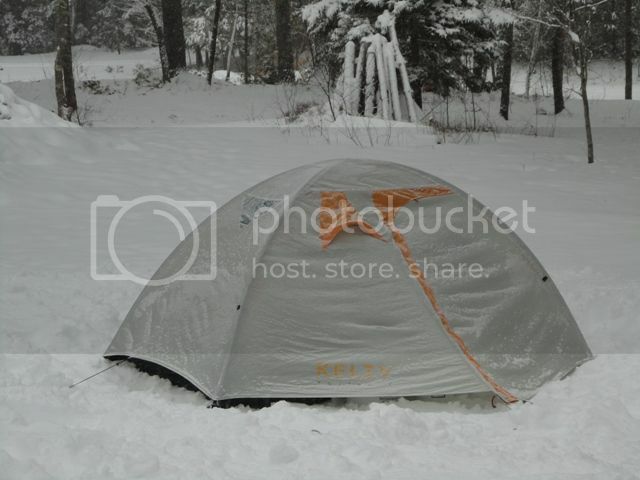 My backpacking days are over, but I car camp all year... you gotta' love Florida's weather for year 'round outdoor fun!! Sosteve, bacpacjac and Blade21 like this. Sierra Designs Mountain Guide 4 season. its' my older brothers and served the 3 of us well on our week outing in Colorado. Worked out pretty nicely, stayed very dry and held up to some pretty stellar winds up around the peak. The tarp was very light thankfully.. we packed heavy lol (Heaviest pack came in just under 45lbs). We ended up with about 35 miles hoofed. Amazing week. Cuben, while expensive, will serve my needs better. I really like the layout of this shelter. If anyone has experience with it I would love to hear! Can you describe your experiences with the Duomid? 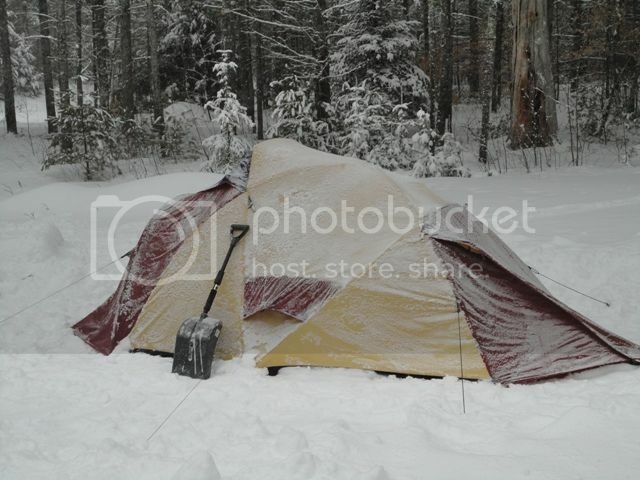 From what I've gathered, it is the go to tent in adverse weather. I know that Andrew Skurka used it throughout his Alaska trek. I am torn between this and the ZPacks Solplex/Duplex in CF. Thank you! certainly I use the Duomid for trips w/ my wife and I, it would be very roomy for one- a wee bit snug for two males. In the summer months we use the inner that MLD makes, in shoulder season we ditch the inner and use a homemade tyvek floor. I've found that it pitches much more secure/stable w/ two poles in an inverted V vs a single pole. You need to use pole jacks to get the length you need, about 10-12"- I use thin walled aluminum-only an oz or so for both of them (some folks-you need two people w/ trekking poles-lash them together in lieu of pole jacks). I've been through several bad storms w/ the Duomid and while not bombproof, it's definitely sturdy- have never had any issues w/ wind or rain. I've had it out a few times in the snow, but not very heavy snow-evidently it handles snow loads pretty well (I think all pyramids do for the most part). I like pyramids, they perform well and don't weigh a lot-w/ a little practice they setup quickly. 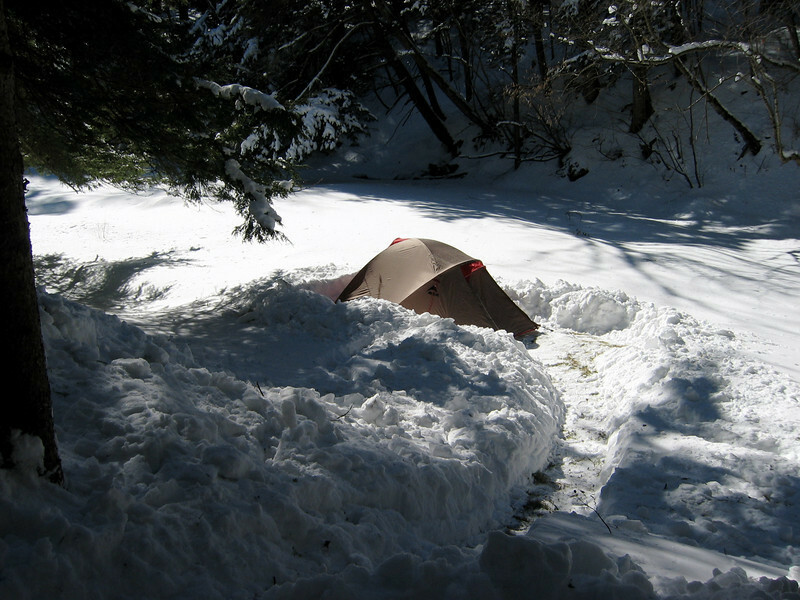 They do take a little more of a footprint than traditional tents, so you might have to hunt a little bit more for a suitable site. If I'm not mistaken, Dave also offers the Duomid in CF as well if you're looking for additional weight savings. 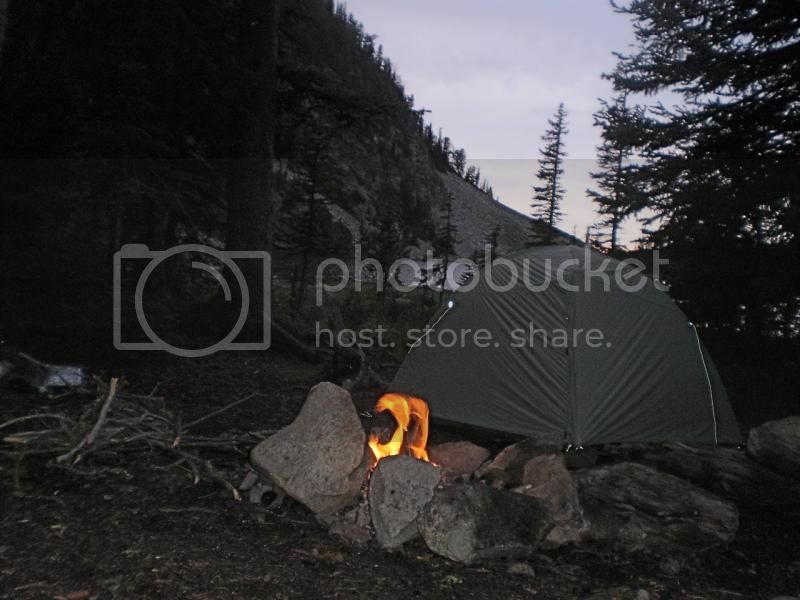 I have an original (about 12 years old) REI Halfdome 2 that looks like the design basis for this tent. the newer version of the HD2 is more complicated with an additional pole. gives a little more vertical headroom but I like mine just fine. if it ever wears out, the Passage is what I'll replace it with. 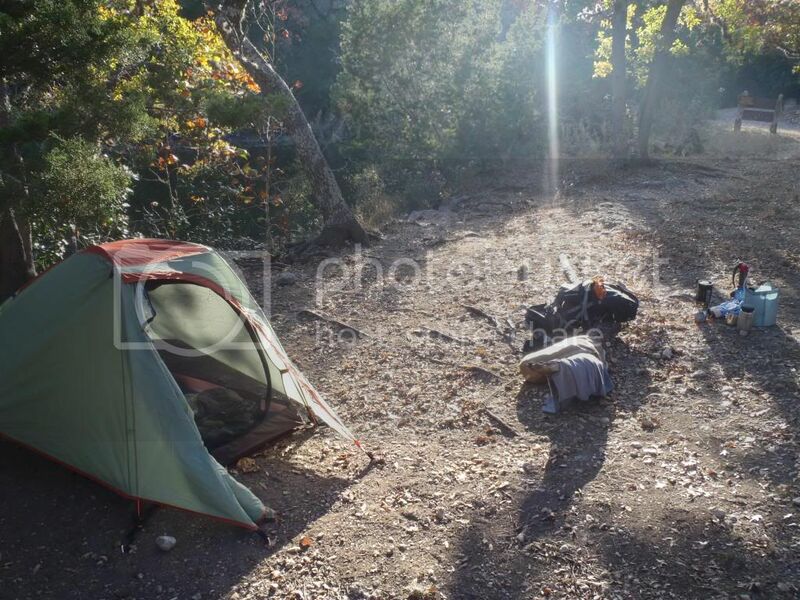 Needed a larger tent as we got out our grandson backpacking this year, went w/ the Mountain Hardwear Skyledge 3. It would be tight for three adults, perfect for two adults and a young one. Extra roomy for two. Two doors, two vestibules, easy setup and withstood one really bad storm in the Crazy Mountains. 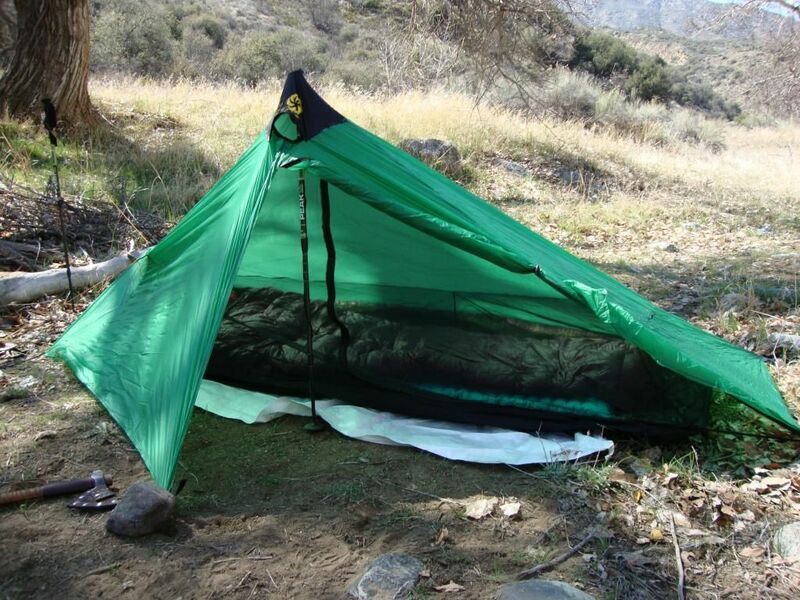 It also can be setup w/ just the footprint and fly, for a sub 3 lb shelter in shoulder season. We've been using this tent a lot this summer and have nothing but high accolades for the tent. Vaude 'Power Taurus Ultralight' 2kg all-in-one pitch, 3000mm siliconised fly, 10000mm floor, 2p; built for Northern Euro conditions ie wind & rain & yet more wind & rain . . .
Wesleypipesyo and Sosteve like this. 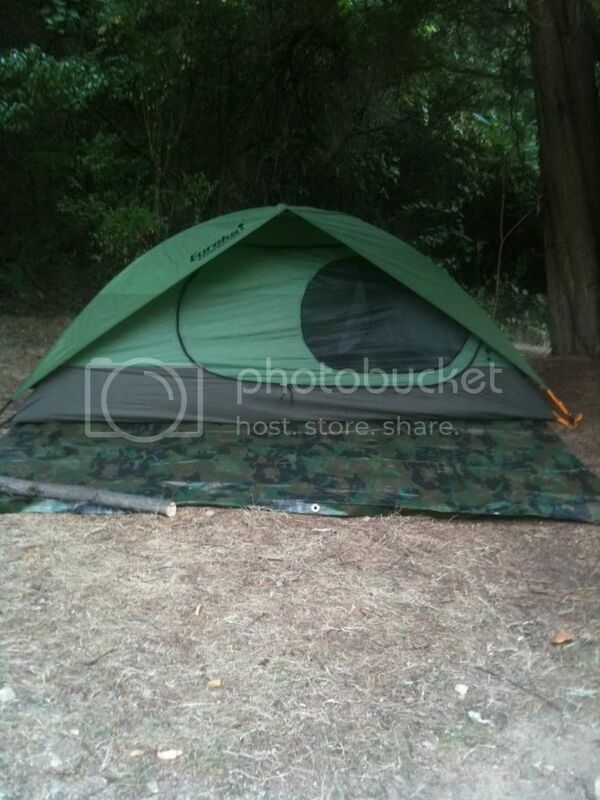 It is not very well known but I think it is killer tent. I brought mine at REI. 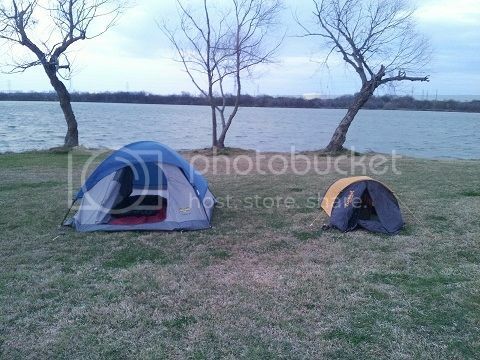 I think it is the best 2 person 3 season tent they sell.